London, UK, 6th February 2019 — Bulls Licensing has appointed CPLG as the Moomins licensing sub-agent for Belgium, the Netherlands and Luxemburg (Benelux). The Moomins – a family of white roundish trolls with large snouts – are the central characters in a series of books and a comic strip by Finnish-Swedish writer and artist Tove Jansson. Jansson achieved worldwide fame as the creator of the Moomin stories, written and illustrated between 1944 and 1971, which follow the characters’ adventures in the idyllic and peaceful Moominvalley. 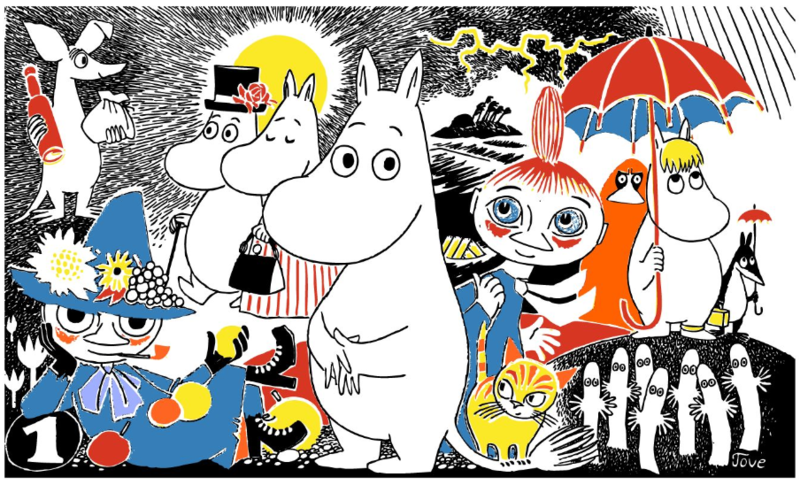 Moomins has an established global licensing programme with over 700 licensees worldwide, including a theme park and branded cafés. The characters have also starred in popular TV-shows and films. CPLG will build on this success in the Benelux region, working with best-in-class licensees across homewares, apparel, gifting, food, toys and games, targeting baby through to adult fans. MOOMINVALLEY, the new TV adaptation of writer-illustrator Tove Jansson’s classic and much-loved stories about the Moomins is premiering in spring 2019 on YLE in Finland and Sky in the UK. The new animation series will be made using state-of-the-art 3D CGI to introduce the Moomins to a new generation – and to screens in a way never seen before. Bulls Licensing is the worldwide licensing agent on behalf of Moomin Characters and the pioneering agency for licensed and editorial content in Scandinavia. Founded in 1929, Bulls has built a solid track-record in generating revenue from brand properties. With an established network of sub-agents and over 700 licensees globally, including Uniqlo, H&M, Samsung and Finnair, Bulls is the perfect choice for any brand owner looking to increase its revenue. The Moomins were created by Tove Jansson (1914-2001), painter, illustrator, author and one of Finland’s key artists. Moomin Characters Oy Ltd is the official body responsible for Moomin copyright supervision. The company was founded by Tove Jansson and her brother Lars Jansson in 1958 and the company is still run by family members. All of the Moominvalley characters are globally registered trademarks. CPLG (www.cplg.com) is one of the world’s leading entertainment, sport and brand licensing agencies, with offices in the UK, Benelux, Nordics, France, Germany, Italy, Spain, Sweden, Poland, Middle East, Greece & Turkey and the US. Owned by DHX Media (www.dhxmedia.com) a leader in the creation, production and licensing of family entertainment rights, CPLG has more than 40 years of experience in the licensing industry. It provides each of its clients with dedicated licensing and marketing industry professionals and a fully-integrated product development, legal and accounting service. CPLG believe that collaboration is about clarity, openness and trust, and is widely known for its no-nonsense, straightforward approach – Expert Common Sense. DHX Media Ltd. (TSX: DHX, NASDAQ: DHXM) is a global children’s content and brands company, recognized for such high-profile properties as Peanuts, Teletubbies, Strawberry Shortcake, Caillou, Inspector Gadget, and the acclaimed Degrassi franchise. One of the world’s foremost producers of children’s shows, DHX Media owns the world’s largest independent library of children’s content, at 13,000 half-hours. It licenses its content to broadcasters and streaming services worldwide and generates royalties through its global consumer products program. Through its subsidiary, WildBrain, DHX Media operates one of the largest networks of children’s channels on YouTube. Headquartered in Canada, DHX Media has offices worldwide. Visit us at www.dhxmedia.com.